Nefertiti has loads of references from the time her husband still reigned as Amenhotep IV until year 16 of his reign. In all of those she is never referred to as anything else than Great Royal Wife or mother of the known princesses from their marriage. Potentially she became his co-ruler and successor as Neferneferuaten even that pharaoh is linked to Achnaten as being married to him. With Sitamun, Isis and possibly a third sister of Achnaten all married to their father Amenhotep III and all listed as the king's daughters it is at the very least unlikely that a full sister of them marrying their brother Amenhotep IV would not be listed as daughter of Amenhotep III during his reign as as king's sister during Amenhotep IV's reign. What would be better to stress the royal couple's status as earthly variations of the twingods than to meantion their sibling-relation? Mutbenret is described as Nefertiti's sister but never as the daughter of Amenhotep III and Tiye. So Nefertiti cannot have been a full sister-wife of Achnaten. Considering she is the most likely candidate to be the maternal grandmother (potentially great-grandmother) of Tut's daughters we can conclude that she was related in the female line to Achnaten's maternal grandmother Thuyu. Thuyu herself is possibly a female line descendant of Ahmose-Nefertari thus making Nefertiti another descendant. We know Achnaten was married to several women. Nefertiti and Kiya are the best known wives. Do you really think that the birth of a prince from a union with one of his sisters would not have been described on many monuments? It all supports the theory that KV55 is not Achnaten. That means that he has to be someone else. The only known young pharaoh of that period is Smenkchare. He became pharaoh at the end of Achnaten's reign or after it. Tutanchamun was born before that time so the marriage of a prince Smenkchare to one of his sisters can easily have gone unrecorded for present time. As pharaoh Smenkchare had one Great Royal Wife: Meritaten but possibly was also married to her younger sister Anchesenpaäten. Tut's Great Royal Wife Anchesenamun is never listed as the daughter of Achnaten, but at the same time she is never listed as her husband's sister either. Making it less likely they were (half-)siblings. They were probably first cousins, linking the two lines of descendants of Amenhotep III and Tiye. Nefertiti is most certainly NOT mentioned in "thousands of inscriptions". That's an outrageous claim. seriously? you think she is mentioned in less than 2 thousand inscriptions? that's hard to believe. considering all the damage done to the amarna period, she is still one of the most proflic of egyptian queens. And my guess is, had Meritaten and Ankhesenamun had "loads of references" it would have been exactly the same for them "as queens" because that is the picture as it stands. They only used "Hmt nsw wrt". They were daughters of a king--so what does it prove? Obviously nothing. Perhaps it would have been nice--but it wasn't done. On the other hand, what would have been the point of elevating Nefertiti to the status of a goddess if she was a mere commoner and not the equal of Akhenaten? Shu and Tefnut were both children of Ra. Unfortunately, the term for "sister" in ancient Egyptian can mean "female cousin", as well. Mutbeneret is depicted in the tomb of Ay and Tey at Amarna, so she might have been their daughter. Tey claims that she had "nursed the goddess", meaning Nefertiti, so perhaps the women had been milk-sisters. In order to be able to nurse a child, you have to have one of your own. That's pure conjecture. Just because Thuyu's son was a high priest doesn't mean she was a descendant of Ahmose-Nefertari. How? What's the lineage, in your opinion? No, I don't--because that's not what happened. I do agree with Gabolde, however, that the baby depicted in the royal tomb at the time of the funeral of Meketaten is Tutankhaten. There is a block, however, that mentions Tutankhaten as "king's son". But the KV55 individual is the father of Tutankhamun. And the mother is his full sister. They are the children of Amenhotep III and Tiye. Meritaten and Ankhespaaten are excluded from that DNA picture. And, once again, there is no proof whatsoever that Smenkhkare was a prince. You demand all kinds of proof in writing that Nefertiti was a king's daughter--but are perfectly willing to accept all sorts of things as facts where there is no proof whatsoever! Not very consistent. Are you saying there was no Ankhesenpaaten who was "king's daughter of his body, beloved of him, born of the great royal wife, Nefertiti" at Akhetaten? Im not saying Anchesenamun was not the king's daughter. She was the daughter of Achnaten, most likely she was first known as Anchesenpaäten and born as the third daughter of Achnaten with his Great Royal Wife Nefertiti. In my view her husband Tutanchamun was her first cousin, the child of her father's full siblings Smenchkare and his first sister-wife. This princely couple married when the marriages of Achnaten did not produce the desired son. His Great Royal Wife had by that time given birth to three or possibly four daughters and it seems his marriage to Kiya also only provided one daughter. Queen Tiye might very well have had a hand in this back-up plan to provide a second line from her husband and herself to succeed in case her reigning son would not have any sons. The young princess marrying her brother Smenchkare succeeded in the plan giving birth to a son. She died soon afterwards. This is also supported by the important role Tut's nurse Maia had in his life. At the end of his reign Achnaten married his widowed brother to his oldest daughter. The strongest argument against Tutanchamun as Achnaten's son is that he did not succeed him. If Tut had been the only son of Achnaten he would have been the successor whatever his age was at Achnaten's death. The fact that Smenchkare and Neferneferuaten reigned with/after Achnaten indicates that Tutanchaten was not Achnaten's son but his nephew. as for tiye being worshipped as hathor, connor and cline said she was. so doesn't really matter if you don't believe it. you also have later examples of royal women being worshipped as goddesses: nefertari at abu simbel and cleopatra famously worshipped as isis. there is a very fine line between godesses such as isis/hathor/sekhmet/tefnut. most have very little to distinghuish them. hathor and isis wear the same crown with the horns and sun disk. usually only the inscription tells you which goddess it is. Aidan Dodson agrees with me, it would appear, and I am hardly surprised--but I guess it won't matter to you since you've already made up your mind. "Amarna Sunset" , page 116: [referring to Queen Mutnodjmet shown as a sphinx] "...Such representations of a royal lady were not uncommon, and mark a continuation of a series of "powerful " representations of queens that begin with Tiye A who is shown in sphinx form at Seidinga where she combines with Tefnut "great of fearsomeness", incarnate in the sphinx." Nothing about Hathor. I told you it was nothing but a theory and that goes for all the rest of the "queens worshipped as Hathor" stuff you're trying to peddle. Lipinska, J. 1990. Stela of the sculptor Ken. In B. Schmitz, and A. Eggebrecht (eds), Festschrift Jürgen von Beckerath: zum 70. Geburtstag am 19. Februar 1990: 171-174. Hildesheim: Gerstenberg. Quote from OEB: Publication of a miniature limestone stela, found at Deir el-Bahri, representing the Hathor cow on a bark and a female figure on a pedestal. It is argued that the latter may be identified either with another form of Hathor or with the deified Tiye. Morkot, R. 1986. Violent Images of Queenship and the Royal Cult. Wepwawet 2 (Summer 1986), 1-9. Quote from OEB: Queen Tiye is shown with divine attributes, she appears in the form of a female sphinx trampling enemies, or she is shown standing on a prostrate enemy. In her own temple at Sedeinga she appears as a striding lioness and is associated with Hathor, Isis and Weret-Hekau. Ryhiner, M.-L. 1955. La procession des étoffes et l'union avec Hathor. Rites égyptiens 8. Bruxelles: Fondation Égyptologique Reine Élisabeth. Quote from OEB: In the Luxor temple the ceremony is embedded in the context of the preparations for the sacred marriage between Amenhotep III and queen Tiye in her role of Hathor-Maat. "It is argued" is just another way of saying "nobody knows for sure". Wow--now Isis, too! This is a prime example of the kind of mumbo-jumbo some Egyptologists are fond of engaging in when it comes to things associated with religion. I wish I could find the cartoon that depicts an ordinary thing sticking out of the ground but has an Egyptologist spouting off to another about all the religious symbolism associated with what appears to be no more than a dead twig. They really knock themselves out, don't they. If you gather enough of these useless quotes it will appear as if Tiye embodied every goddess in Egypt. No, it doesn't. The queenly crown worn by Tiye and even Nefertiti, incorporating a disk and horns came to represent one thing only--motherhood--as derived from the sacred cow, who is even shown suckling the king. If it was seen as being associated with Hathor, the queen as personification of Hathor, Nefertiti wouldn't have been wearing this head gear with the rays of the Aten shining down upon it. No matter what has been discovered in the homes of private individuals at Akhetaten--the official stance was "no other gods" and that couldn't be more obvious. The king, who in all other periods of Egyptian history is depicted in the company of various deities---is never shown with any of them during the Amarna interlude. Only the Aten. All the forms of the sun and the gods associated with it were acceptable. Or it just means you don't like the answer, as there is a great deal of info on Tiye as representing Hathor. No, it doesn't. The queenly crown worn by Tiye and even Nefertiti, incorporating a disk and horns came to represent one thing only--motherhood--as derived from the sacred cow, who is even shown suckling the king. If it was seen as being associated with Hathor, the queen as personification of Hathor, Nefertiti wouldn't have been wearing this head gear with the rays of the Aten shining down upon it. Bleeker, C. J. 1973. Hathor and Thoth: Two Key Figures of the Ancient Egyptian Religion. Studies in the History of Religions (Supplements to Numen) XXVI. Leiden: Brill. Griffis-Greenberg, K. 1998. The Guiding Feminine I: The Goddess Hathor: (Part I) Symbol of Attraction and Power. InScription: Journal of Ancient Egypt 1: 43-7. Pinch, G. 1993. Votive Offerings to Hathor. Oxford: Griffith Institute. Roberts, A. 1995. Hathor Rising: The Serpent Power of Ancient Egypt. Devon: Northgate Publishers. Robins, G. 1995. Reflections of Women in the New Kingdom. Ancient Egyptian Art from The British Museum. 4 February - 14 May 1995. Atlanta:. Michael C. Carlos Museum/Emory University. No matter what has been discovered in the homes of private individuals at Akhetaten--the official stance was "no other gods" and that couldn't be more obvious. The king, who in all other periods of Egyptian history is depicted in the company of various deities---is never shown with any of them during the Amarna interlude. Only the Aten. All the forms of the sun and the gods associated with it were acceptable. I can think of a number of articles which disagree, as well as the very accepted fact that only the Amunic triad were proscribed cults and no other. There was no attempt (even on Akhenaten's boundary stelae) to deny respect or lands (such as Hermopolis, which is near Amarna) to other gods such as Thoth, Ptah, and so on. Bomann, A. H. 1991. The Private Chapel in Ancient Egypt. A Study of the Chapels in the Workmen's Village at El Amarna with Special Reference to Deir el Medina and Other Sites. Studies in Egyptology. London: Kegan Paul International. Stevens, A. 2006. Private religion at Amarna: the material evidence. BAR International Series 1587. Oxford: Archaeopress. _________. 2003. The material evidence for domestic religion at Amarna and preliminary remarks on its interpretation. Journal of Egyptian Archaeology 89: 143-168. In short, Atenism was a royal cult, and pretty much adhered to by the royal house and a few courtiers, but it was not a widespread cult. According to one colleague who has worked at Amarna, not one household shrine to the Aten has ever been located in a private dwelling, nor have amulets dedicated to the deity been found as well. Yet, amulets to Bes, Hathor, Thoth, etc. have been found at Amarna, even a Bes amulet was found within the Royal Tomb at Amarna. Or is it just a case of people repeating what they read in someone else's paper--as so often happens in Egyptology? "Abiding by the literature", if one doesn't happen to have a contrary opinion. If you know so much about it, why don't you show some pictorial examples instead of merely supplying quotes, which hardly enlighten? There wasn't even a temple shrine as the Aten didn't have a cult statue! It was the disk of the sun. All one had to do was look up to see it. 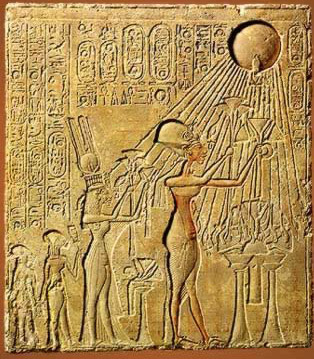 But there were depictions of the royal family worshipping the Aten or being blessed by the rays in the homes of the wealthy. That was the "shrine"--and you can see a photo of one on page 230 of Barry Kemp's book, "The City of Akhenaten and Nefertiti, Amarna and Its People." not like your doing anything different. instead of being a smart alec, you could just look up the sources she's giving you. she'd done her job, she's told you were she got the info from. balls in your court now, as to whether you actually investigate those sources or just sit back and question her credentials. Not true. That's what you do. I show the evidence--back up what I say. Don't look now--but that's how things work in a forum like this. Or do you really think it would be more fun if people just gave citations and nothing more? instead of being a smart alec, you could just look up the sources she's giving you. she'd done her job, she's told you were she got the info from. balls in your court now, as to whether you actually investigate those sources or just sit back and question her credentials. Maybe you should stop behaving like a ridiculous sycophant. I don't have to investigate anything. Been there. Done that--long ago. That's how I know what I'm talking about. Whether you believe it or not--I couldn't care less. i never said you HAVE to do anything. i'm just pointing out it's quite rude, lazy and downright waste of anyone's time if you sit there on your high horse, and demand sources for what is said, and then don't bother to check up on them. what are you afraid of? that your theory might actually be wrong? that you may have to adjust it or drop it? i don't care what it is you THINK you KNOW (but your certainly wrong on a few things, and that's fine. it's your choice to choose what you believe). but i'm more inclined to believe an actual egyptologist (neseret) over you. since you seem to have a disrepect for actual knowledge (with citations). i'm telling you now, i won't be replying to any other personal comments. there's no point. Maybe you should stop behaving like a ridiculous sycophant. Personal attacks will not be tolerated. One and only warning.